Let’s face it: your face is one of the first things you present to the world, and whether you’re into make-up or not, healthy skin is important to all women. 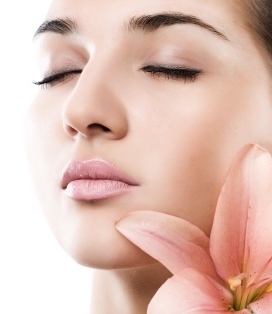 A great daily skin lotion is especially important as we age and gain larger pores, wrinkles, and age spots. But what if, like me, you’re beyond the sparkling clear days of your teenage skin but don’t feel the need yet to use “Age-Intensive” lines of skincare? Or what if you want to make your skin tone more even without resorting to expensive chemical peels? Enter Neutrogena Healthy Skin Face Lotion, the first skin product I have actually loved, and which some have called “magic in a bottle” (from a review on Neutrogena.com). 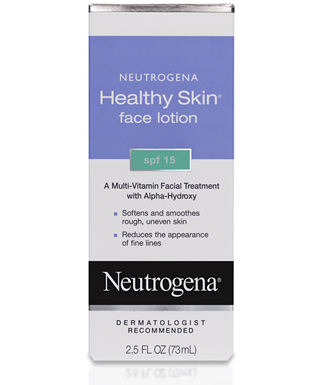 According to Neutrogena’s Web site, their Healthy Skin Face Lotion “eases away the appearance of fine lines, blotches and discolorations for a more vibrant, even-toned complexion.” A chart on the back of the packaging says that in just two weeks, skin will appear smoother and softer, and in four weeks, skin will significantly improve in softness, smoothness, and radiance. In fact, Neutrogena Healthy Skin Lotion lived up to its promises. I had originally gotten this lotion because I was worried about my increasing freckles or age spots, and surgery was out of the question. Also, I had prior good experiences with Neutrogena. After using it consistently about 3-4 times a week, for two weeks, I already noticed that my skin was smoother and softer. After a month, I felt that my skin tone was more even as well. People commented on my complexion and asked what I used. I had never gotten these results before, even when consistently using Aveeno’s Positively Radiant Daily Moisturizer, which also claimed to be “clinically proven to even tone and texture.” There was only one minor downside, which I’ll get to in a minute. The lotion is light and non-greasy. As the Web site says, it’s oil-free and non-comedogenic (won’t clog pores). It goes on smoothly and absorbs quickly and well. The lotion also smells great. An older version I had used smelled slightly sour, and other customers have complained of it, but this one didn’t have that same smell. The pump bottle makes it easy to dispense, and just two pumps are all you need for the day, without needing to reapply. It does just what it says it will: soften, smooth, and brighten skin, and even out texture. Customers have said that it helped rid them of acne, erase acne scars, prevent breakouts, and helped with eczema. It only comes in a 2.5 fl oz bottle. However, this does seem to last quite a long time, for over half a year. There is a risk of skin irritation or increased skin sensitivity to the sun and possible sunburn. Thus, those who have very sensitive skin should not use this and use “Neutrogena Oil Free Moisture, Sensitive Skin” or other sensitive skin products. The packaging warns of this risk and advises using the lotion every other day if there is irritation until skin adjusts, and limiting sun exposure and using sunscreen for a week after the first use of the lotion. I didn’t seem to get any irritation, although I did feel, like other customers, that it stung for the first few times I applied it. I dutifully followed the every-other day application for a week and used sunscreen, and didn’t have any problems with sunburn or irritation after that. Most customers recommend applying it at night, then wearing a moisturizer with higher SPF or a sunscreen during the day. There are other similar products, such as Aveeno’s Active Naturals Positively Radiant Daily Moisturizer SPF 15 or Lubriderm Daily UV Lotion with Sunscreen or Kiss My Face Natural Moisturizer Everyday SPF 15, but most don’t treat uneven skin tone or are more expensive for the same type of anti-aging properties. For those who have sensitive skin, they may need to use another product or use it only at night in conjunction with a suncreen moisturizer during the day. 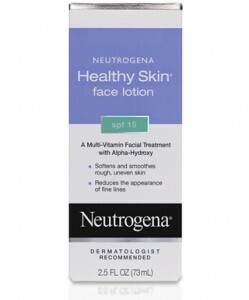 But otherwise, for a simple, effective, and inexpensive daily anti-aging moisturizer that really works, I highly recommend Neutrogena Healthy Skin Face Lotion.